There was a time when action movies were simple. Ah, yes, we’re going in the Wayback Nostalgia Machine again so brace yourself. There were movies where the good guys were good guys, and the bad guys were bad guys, despicable without an ounce of anything even remotely redeeming. I like to call this time in Hollywood history…..the 1980s. That’s simplifying the premise too much, but my point is valid. We had the Russians/Soviets/Commies to root against. 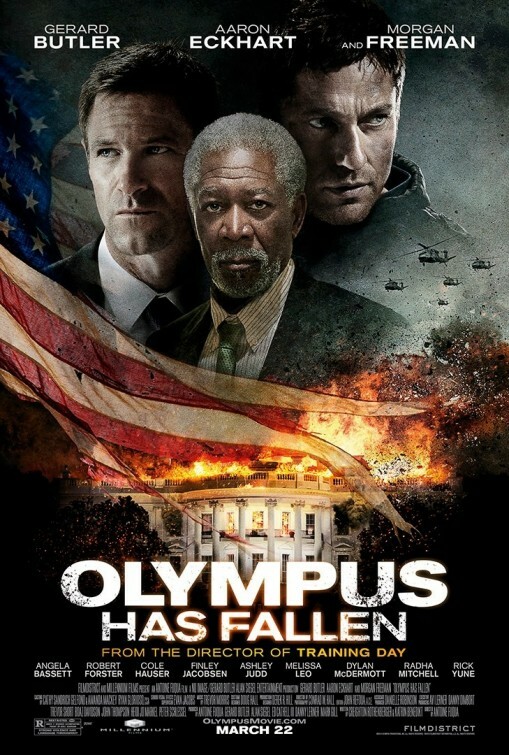 In the vein of those straightforward, black and white action movies come 2013’s “Olympus Has Fallen“. 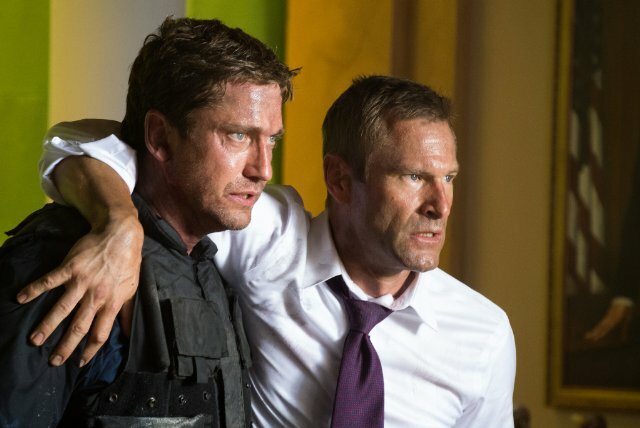 A longtime Secret Service agent and the head of the Presidential detail, Mike Banning (Gerard Butler) is removed from his post when President Benjamin Asher (Aaron Eckhart)’s wife is killed accidentally in a winter car wreck. Banning leaves the Secret Service and takes a job in Washington D.C. as a U.S. Treasury agent. Some 18 months pass, and Mike still yearns to get back to what he was so good at and loved. He may get his chance. Sneaking into the White House as part of a South Korean diplomacy party, a North Korean paramilitary terrorist, Kang (Rick Yune, “Die Another Day”), leads a well-coordinated attack that decimates Washington and takes over the White House, capturing the President and much of his cabinet. As the bodies mount in the lightning-quick strike, Mike is among those fighting back, even managing to get into the White House in all the bloody, bullet-riddled chaos. As the terrorists make their demands and the nation and the world wait to see what happens, Mike works from the inside, using all his know-how and skills to take down the North Koreans. Does this movie sound even remotely familiar? It should. 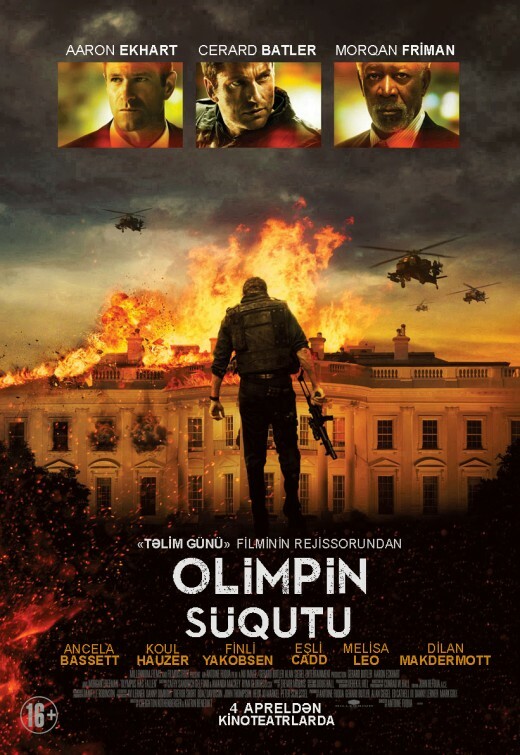 From director Antoine Fuqua (“Training Day” and “Tears of the Sun”), ‘”Olympus” is a not-so-subtle tweaking of “Die Hard” meets “Air Force One”. Whole scenes from those movies are tweaked, twisted and prodded here and there to make it slightly different. More than just those two movies, it plays like every action movie you’ve ever seen and will see ever again down the road. So what else to say about this one rather than wrap it up here? Ready for a twist? I LOVED this movie. It’s so epically stupid I can’t even describe, but I loved it. I betcha didn’t see that one coming, now did you? Don’t be confused. This isn’t a good movie with all its mindless action, cardboard characters and goofy one-liners. What is it then? This is a popcorn movie. Sit back with a big tub of popcorn, turn off your brain and just enjoy a movie for a change. So how to explain why I liked this movie? Action movies aren’t just action movies anymore. Too often they have to throw a ridiculous twist at you or telegraph a horrifically unsubtle, heavy-handed message at you. “Olympus” gets back to the basics in a big way. Americans = Good. North Koreans = Bad. The timing is also interesting considering North Korea’s recent threats of firing nuclear weapons at the U.S. but that’s for someone significantly more cultured and intelligent than me to analyze. I’m more of an explosions and gunfight kind of guy. If familiar, the premise is very cool, an unsettling attack on Washington D.C. setting the tone for the rest of the movie. It’s incredibly uncomfortable to watch civilians get shot down in the street, the Washington Monument crumbling, the White House under heavy attack with Secret Service and military forces shot down in droves doing their duty. In a very straightforward movie, there’s something primal in these scenes. If it sounds simplistic on my part, so be it. America gets attacked, and Americans fight back. Cue a pissed-off Scotsman in Gerard Butler, and we’ve got ourselves an action flick. I like Gerard Butler. I don’t always like his selection in movies, but I like him just the same. This is him doing what he should be doing. He handles himself well in drama and comedy, but I think he’s best as an action star. Here as the ex-Army Ranger turned Secret Service agent turned Treasury agent, it’s ideal casting. His past haunts him, and he wants to make things right. When the White House, the President, and America (cue dramatic music), Butler’s Banning steps to the plate. As an action star, he’s extremely capable. He’s believable in his fight scenes, believable as he sneers and snides his way through countless cheesy one-liners. The dynamic between Banning and Yune’s Kang is eerily reminiscent of Bruce Willis and Alan Rickman in Die Hard so as long as you’re going to rip a movie off, at least rip off a good one. Moral of the story is this, Gerard Butler is cool and a more than worthy leading man as an action hero. The casting on the whole is solid. It’s also fair to say not much of the talent assembled here is given much to do, but whatever, minor complaint. Eckhart is a solid President, an everyman who wants the best for his country and his son (not shrill but talented Finley Jacobsen). His Cabinet and the government higher-ups include Morgan Freeman as the Speaker of the House, Melissa Leo as the Secretary of Defense, Robert Forster as Army Chief of Staff, Sean O’Bryan as Deputy National Security Advisor and Angela Bassett as the head of the Secret Service. Oh, yeah, also look for Dylan McDermott, Ashley Judd, Radha Mitchell and Cole Hauser in key supporting roles. Lots of people, lots of talent. Underused and/or misused maybe, but it’s fun seeing so many big names together. Enough with all this acting mumbo-jumbo. This is a movie about action and gunfights and stabbings and explosions! Borrowing heavily from “Die Hard”, Banning works from inside-out at the White House, trying to take down the North Koreans one by one. Oh, and those North Koreans are highly trained commandos so we’re in store for some good, old-fashioned hand-to-hand combat. If it’s a little clichéd, so be it. The bad guys for the most part can’t hit anything (Mike), but Mike can hit everything (North Koreans). The North Korean attack on D.C. is something else to watch, a meticulously coordinated attack that’s brutal in its efficiency. Without giving away too much, the action is brutal, hard-hitting and even features some solid surprises along the way. Is this one predictable? Oh, yes. You’ve probably got a good sense of where this one is heading as of right now….without having seen a second. Wait!!! 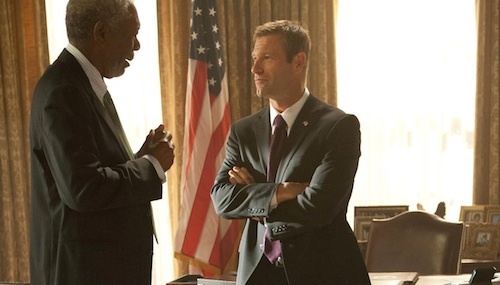 Morgan Freeman becomes the President?!?! The North Koreans are brilliant in executing a plan but can’t capture one freaking man?!? We get lots of shots of American flags blowing in the wind – to composer Trevor Morris’ patriotic score – and a general feeling of patriotism and national pride. It’s a good movie. Don’t overthink it or its rather obvious influences. Enjoy it for what it is, a shoot ’em up action flick with a cast that looks to be having a lot of fun. The movie has fun action, and that’s what it’s meant for. Nothing more, nothing less. Solid review Tim. Thanks, CMrok93! That’s what I liked about it. Action, action and more action. Barebones and it’s the better for it.